Get up to speed on the latest features and enhancements to InDesign CS5 As the industry standard in professional layout and design, InDesign delivers powerful publishing solutions for magazine, newspaper, and other publishing fields. This introductory book is an easy-to-understand reference for anyone migrating from another software application or those with little-to-no desktop publishing experience. You ll explore InDesign basics and examine the enhancements to InDesign CS5, while you also discover how pages work, build templates, create frames and shapes, manage styles, and much more. * InDesign is proving to be an increasingly popular layout and design application; InDesign CS5 includes new functionality and enhanced tools * Teaches all the basics for first-time users, including how to open and save your work, arrange objects, work with color, edit text, manage styles, finesse character details, add special type, import and size graphics, set paths, work with tabs, create indices, and more * Demonstrates how to calibrate colors, export PDF files, fine-tune paragraph details, create frames and shapes, manipulate objects, and work with automated text InDesign CS5 For Dummies offers a straightforward but fun approach to discovering how to get the most from your desktop publishing experience when using InDesign. How do you design? Free-form, creating one-of-a-kind pieces? Or would you love a highly formatted template that you could modify as needed for regular periodicals? InDesign is the right tool for both approaches, and this is the right book to help you master the essentials. Learn to set up your documents, prepare them for output, and get creative! Introduction. Part I: Before You Begin. Chapter 1: Understanding InDesign Ingredients. Chapter 2: Making InDesign Work Your Way. Part II: Document Essentials. Chapter 3: Opening and Saving Your Work. Chapter 4: Discovering How Pages and Layers Work. Chapter 5: The Joys of Reuse. Chapter 6: Working with Color. Part III: Object Essentials. Chapter 7: Adding Essential Elements. Chapter 8: Manipulating Objects. Chapter 9: Organizing Objects. Chapter 10: Aligning and Arranging Objects. Part IV: Text Essentials. Chapter 11: Putting Words on the Page. Chapter 12: The Ins and Outs of Text Editing. Chapter 13: The Styles of Text. Chapter 14: Fine-Tuning Paragraph Details. Chapter 15: Finessing Character Details. Part V: Graphics Essentials. Chapter 16: Importing Graphics. Chapter 17: Fitting Graphics and Setting Paths. Part VI: Getting Down to Business. Chapter 18: Working with Tabs and Tables. Chapter 19: Working with Footnotes, Indexes, and TOCs. Chapter 20: Working with Automatic Text. Chapter 21: Publishing Books. Part VII: Printing, Presentation, and Web Essentials. Chapter 22: Printing and PDF ing Your Work. Chapter 23: Web Project Basics. Chapter 24: Presentation Project Basics. Part VIII: The Part of Tens. 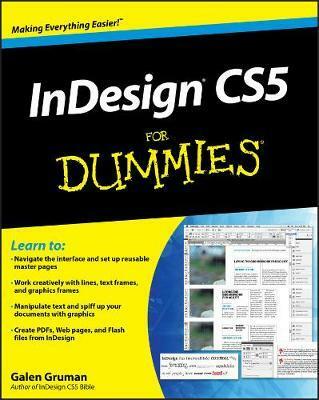 Chapter 25: Top Ten New Features in InDesign CS5. Chapter 26: Top Ten Resources for InDesign Users. Index. Galen Gruman is the principal at The Zango Group, an editorial and book production firm. He has designed and produced numerous publications. Galen has authored or coauthored more than 20 books on desktop publishing, and he is currently the Executive Editor for InfoWorld.